Biotech giant Monsanto has worked for at least the last 20 years to use genetically modified organisms to replace nature and eliminate billions of years of evolution, all for their greater profit and control, author Jeffrey Smith, told RT. Smith, who has written extensively about genetically modified organisms, said impending mass demonstrations around the globe aimed at protesting Monsanto and genetically modified crops is the world’s way of rejecting the company’s grim vision of the future. RT: Monsanto claims there is no existing proof that GMOs cause health problems. You wrote a book entitled, “The Documented Health Risks of Genetically Modified Foods.” What do you say about these risks? JS: There are thousands of doctors prescribing non-GMO diets, and people are getting better from gastrointestinal disorders, immune problems, organ damage, etc. When the American Academy of Environmental Medicine looked at the animal feeding studies on GMOs, they said that the lab rats had suffered from these same problems. And these same problems are on the rise in the US population since GMOs were introduced. Now we know that the GMOs on the market have either higher levels of weed killer – Roundup, which is toxic – or a bug killer, Bt toxin. If you look at the characteristics of these toxins in Monsanto’s crops, it would predispose us to these same disorders. RT: Are the toxins, the pesticides you’re referring to, are they applied to the crops or is it part of the genetic coding of it somehow? JS: For corn and cotton, they actually insert a gene from bacteria that actually produces a Bt toxin. The toxin breaks open holes in the stomachs of insects to kill them. They promised us up and down that it would have no effect on humans, but a 2012 study showed that it poked holes in human cells as well. And it actually gets into our bloodstream, and for pregnant women, it gets into the unborn fetuses. For Roundup-ready crops, those are crops inserted with a gene that allows the crops to be sprayed with Roundup herbicide. The Roundup gets absorbed into the crops and is stored in the food portion which we eat. A recent paper on Roundup linked it to obesity, diabetes, cancer, heart disease, multiple sclerosis, anorexia, autism, Parkinson’s, Alzheimer’s, aggression and depression, because it cuts off certain metabolic pathways, it kills gut bacteria, it disrupts the digestive channels, and it might even create leaky gut. Monsanto has said, “Oh, it’s as safe as table salt, you can drink it.” Well don’t drink it. It turns out to be one of the more toxic chemicals in the environment than we’ve ever seen. RT: Supporters of GMOs have long been saying that especially among the arguments for using them is the benefits of the enhanced crops being used to feed the world’s population at a time when we have an exploding global population, we need to be able to feed them all. These crops help that. What do you say to that? JS: The average GMO reduces yield. The Union of Concerned Scientists’ report “Failure to Yield” shows that. In fact, the most comprehensive evaluation of agriculture, the ISTAT report signed on by 58 countries, said the current generation of GMOs has nothing to offer feeding the hungry world or eradicating poverty. Whereas sustainable agriculture, in a study of more than 12mn farms, showed an increase of 79 percent in yield. But we also know that feeding the hungry world is not simply just about increasing yield. It’s about access, it’s about poverty issues. But Monsanto wants to make it this magic bullet, and then they don’t even have the data to back that up. So this has just been a public relations spin, and they spent $250mn over five years, with the other biotech industry companies about a decade ago, trying to convince Americans that they needed to accept GMOs because it would feed the world. RT: What substantial change might come from this march? 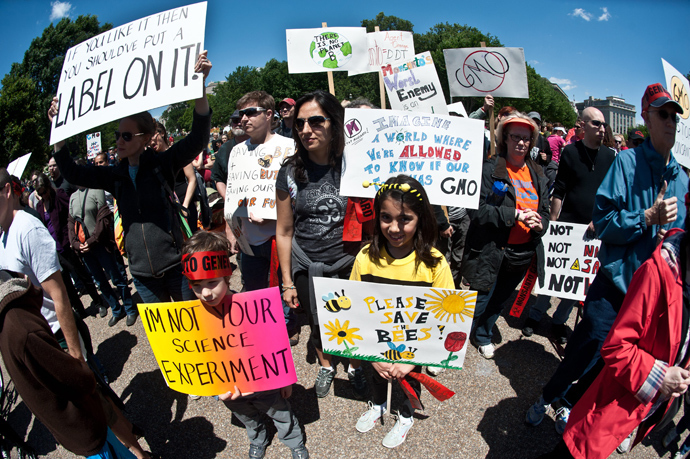 JS: Well, this march is a demonstration that the world is saying no to Monsanto’s vision. Monsanto’s vision was established in the ‘90s, with Arthur Andersen as a consultant – they were also Enron’s consultant. They asked the Monsanto executives, describe your ideal future in 15 to 20 years. And the executives described a world in which 100 percent of all commercial seeds were genetically engineered and patented. And Andersen worked backwards from that goal to create that strategy and tactics to achieve it. So here was a company designing a plan to replace nature. To eliminate the products of the billions of years of evolution and replace it with designer genes and designer organisms for their greater profit and control. And they’ve since become the largest seed company in the world. But we also know, talking to former Monsanto scientists, that they realized that the technology is fraught with unpredictable side effects. One of the former Monsanto scientists told me rats that were fed genetically modified corn, in Monsanto laboratories, that they were damaged severely. So instead of withdrawing the corn, Monsanto covered it up by rewriting the study, which was no surprise to us who have caught them red-handed over and over again. So not only are they planning to replace nature, they’re planning to risk the health of all those who eat. And also release it into the environment, where the self-propagating pollution of the gene pool can affect the ecosystem for all time by changing that gene pool. So that’s why Monsanto has been continuously voted as the most evil company on the planet year after year, with stiff competition.